TALLAHASSEE, FL — For 82-year-old Evangeline Moore, Wednesday was a long time coming. 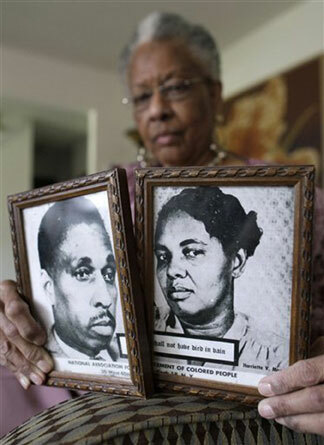 She was 21 when her pa-rents, the teachers and civil rights organizers Harry T. and Harriette V. Moore, died of in-juries after a bomb blew up their home in Brevard County on Christmas Eve in 1951. Evangeline Moore traveled from her home in Maryland to the Capitol for her parents’ induction into the Florida Civil Rights Hall of Fame, with Gov. Rick Scott in attendance. For many, it’s a mystery why the name of Harry T. Moore isn’t spoken in the same breath with Martin Luther King, Jr., Medgar Evers and other civil-rights martyrs. Harry Moore started the Brevard County NAACP in 1934, the first of dozens of branches he would found, and registered tens of thousands of Black voters. He was the first NAACP official killed in the civil-rights era, and the Moores are the only married couple to give their lives in the struggle. But now, looking back, she said, their sacrifice has been vindicated. The Moores fought lynching and segregation as a family. Evangeline said her father was followed when he traveled, so they all traveled together, across the state. She said her parents were remarkable people, and not just in terms of their civil rights work. Harry T. Moore is the subject of a PBS documentary, “Freedom Never Dies,” named for a poem that Langston Hughes wrote about the slaying.